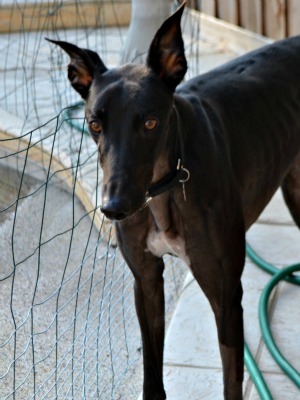 Fleet, aka BC Fleet Street, is a 2-year-old black male born September 18, 2013. His sire is TK Quick Strike and his dam is BC Sweet Bell. He has 18 races on record at Greyhound-data.com, all at Gulf Greyhound Park from April to October 2015. 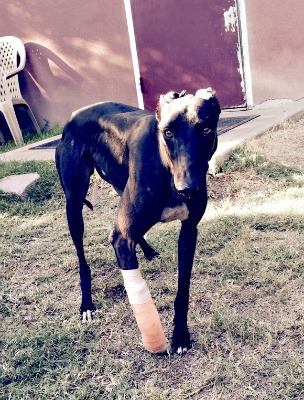 His final race on October 2nd retired him with a stopper bone injury. Fleet has not yet been tested with cats or other small animals. Fleet was examined by Dr. Radasch at the Dallas Veterinary Surgical Center on October 8 for the stopper bone injury to his right front leg. It was determined that no surgery is necessary at this time. Fleet will be leash walked and kept quiet for approximately 4 weeks to allow the stopper bone to heal. Follow up x-rays will be taken at that time. Fleet continues to be leash walked in his foster home. A follow up x-ray is scheduled for around December 1, 2015. X-rays show that Fleet's stopper bone is healed. He is ready to go! The special medical treatment cost needed by Fleet is why the Miss Mesa Fund was established. If you would like to help with Fleet's care, please take a moment to make a donation to the fund. 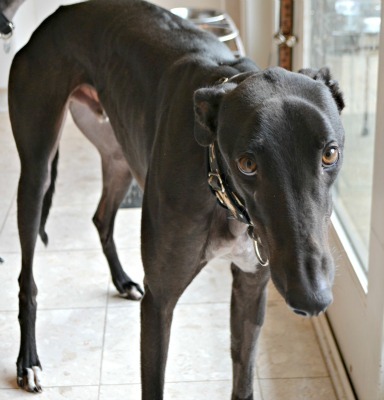 You WILL and CAN make a difference in Fleet's life and the lives of other greyhounds in need of special medical care. Your help and support will make a difference - one greyhound at a time. Please note Miss Mesa Fund/Fleet on your check.